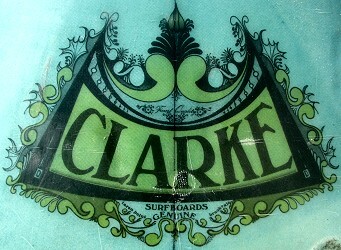 Peter Clarke Surfboards, 20 Carter Road, Brookvale. Foam blank, black resin glueline stringer,Volan glassed laminate tint with 1 1/2 inch rail lap, three quarter deck patch. 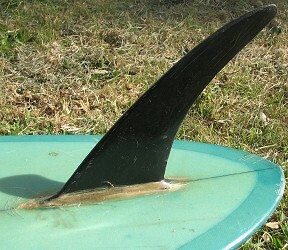 Bottom: Rounded hull - deepest at wide point, Flat behind fin. Taren Point Brookvale- black text in green curved block with scrolling at the sweet spot. Image below. Deck: Volan glassed laminate tint with 1.5 inch rail lap, three quarter deck patch. 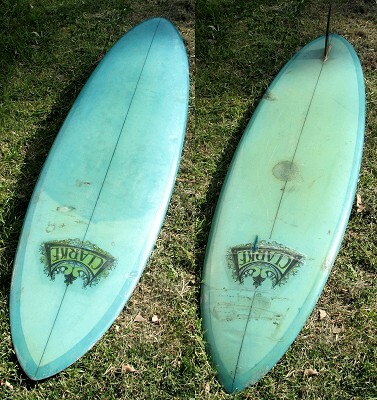 Bottom : Volan glassed laminate tint with 1 1.5 inch rail lap. Obtained from Carrinbah, NSW, September 2008. The deck has small fractures, and some small dings, some staining. Discontinued production circa 1976 when the factory burnt down. The three models were illustrated in Surfing World Volume 12 No. 1 1969. Volume 12 No. 1 1969. Image courtesy of Mr. Gordon Woods. 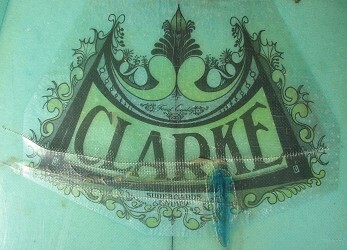 Geoff Cater (2008 - 2017) : Peter Clarke 7 ft Roundtail, 1970.